Tidal showcases MQA streaming at CES 2016 - but launch is delayed | What Hi-Fi? We've had our first listen to high-res MQA music streaming on Tidal here at CES 2016 thanks to Scandinavian music label 2L. But the official launch has been put back (again). It's been much talked about in the run-up to CES this year, and today we heard our first, hands-on demo of MQA (Meridian Quality Authenticated) streaming on Tidal. Exciting stuff. But with Tidal's third chief executive in eight months - Jeff Toig, formerly chief business officer of SoundCloud in Berlin - having just joined the fledgling music streaming company in January, the launch has been delayed once again. However, from a technical point of view we can confirm the Tidal/MQA service works. 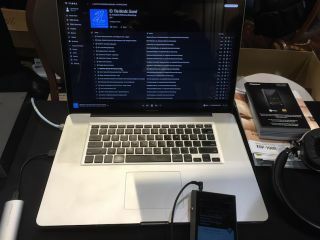 Here at CES Unveiled there was a working demo on a Mac laptop through the MQA-enabled Meridian Explorer 2 DAC and headphones, with MQA music files provided via music label 2L on Tidal. 2L will be the first music label to offer MQA downloads for sale, as we have previously reported. Back in March 2015, Tidal successfully trialled streaming of high-res MQA music files at its Oslo HQ, but this is the first time we have heard it in action. It had been hoped the official launch would be announced at CES, but it appears that may now have been put back a month or two as the new CEO gets to grips with the company. Tidal is not the only company supporting MQA. Also on demo here is the Pioneer XPD-100R portable high-res player working with downloaded MQA music, and other hardware manufacturers such as Onkyo, Bluesound and Auralic have also pledged their support. HTC has also said it will demo a modified version of its One A9 smartphone with MQA technology as a 'proof of concept' here at CES. MORE: MQA Audio - What is it? And how can you get it?